My electrical contractor started this past Saturday. It is amazing how fast they can install the electrical! They began about 9 am and were heading home at 3 pm after completing the electrical for the entire main floor. And that included telephone and cable. Good communication starts before the electrician even arrives. In my request for a quote I provided a layout of both floors of the cottage and clearly indicated where things needed to be. And that means everything! Often your architect plans will provide this. I needed to amend the plan however because (a) I am finishing the basement and b) wanted a different layout for the kitchen. The weekend prior to the arrival of the electrician, my wife and I did a walkabout in the Cottage, imagining where everything goes and discussing the various options. Once we settled on a location we stapled a label in the location. This walkabout is particularly important to get the right location of the ceiling fixtures. Only you know where the dining room table is going or the kitchen island. Left to their own, the electricians are like to just centre the fixtures in the middle of the space - perhaps not in the location you would choose. Plans are not exact, and the locations you picked may not be optimal or to code so it is important to do a walkabout with the electrician to confirm the locations and make adjustments. It is here where you can share with him why you choose that location. Plus your nomenclature for the labels may not be his - communication closes the gap. 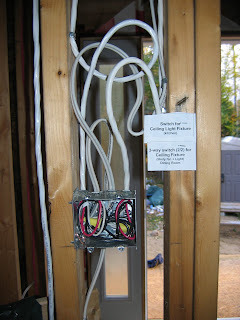 Our electrician was amazed at the labels - I guess he doesn't often get such help from his clients. The walkabout went much faster because of it. He did make a few suggestions, and so we moved things around slightly. The plumbing system has a pressure tank with a connection to the pump in the lake, a sewage sump pump, tankless water heater, and a UV Filter. All require 110 volts. It is real helpful to the electrician if these are at least installed in their locations. That way the electrician can install the required outlets in the right locations. Otherwise he may just put them in the 'area' not taking in to consideration the layout of these fixtures. What other tips can you recommend when dealing with the electrician?